[This year 2012, Jean Marie Zacchi will hold a solo exhibition in Karuizawa after an interval of eight years. Ms. Mimana Hirokawa, the chief editor of Karuizawa Vignette, a popular Karuizawa information magazine, ventured out to interview him in Paris. The painter Jean Marie Zacchi, a holder of the Legion of Honor and the honorary president of the Society of French Artists, is also a great Japanophile. This summer he will hold his second solo exhibition in Karuizawa. 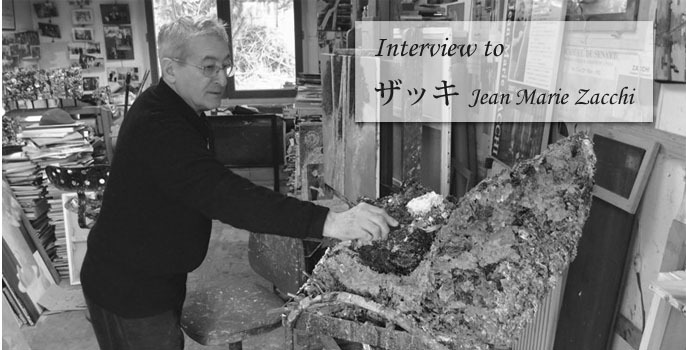 I interviewed him in his studio in the suburbs of Paris about his passion for creativity, his impressions on Japan and Karuizawa, and other topics. Vignette (hereinafter, V): Do you usually paint in this studio? Mr. Zacchi: (hereinafter, title omitted) Yes, I do, almost every day from 8:00 in the morning until 7:30 in the evening; I also paint here at weekends, too. My life is all about painting 200%. Usually my going out and travelling overseas are all to do with my solo shows and painting work. I started painting when I was 12, and exhibited at the Grand Palais at the age of 19, and since 1963 I have hosted solo shows every year without fail. V:　You also serve as the president of various salons at home and abroad and you are a member of several selection committees, so I guess you are pretty busy. Where does your energy to continue painting every day spring from? Zacchi: Why do I paint… It is simply besoin (desire). I am very fond of Bernard Buffet, but unfortunately, he committed suicide. The reason being he was no longer able to paint, and in one way I think it was a powerful declaration. When he was no longer able to work, he could have become addicted to drinking, but he chose to commit suicide. Picasso lived until 92 years old, and continued painting up to the end of his life. Painting is not about money. I too want to continue painting until the end of my life. For me, there is nothing more wonderful than to keep painting until the moment of my death. V: What kind of painter do you consider yourself to be? Zacchi: I’m not a contemporary painter, but when I hold a solo show, young artists tell me, “I want to paint like you.” Personally, I think my painting style is already old-fashioned, so I was surprised. Around 1968, I was happily painting abstract works, but over time, I lost interest in them and had an urge to express different things. So, I returned to realistic paintings for a while and before long, I came to pursue transposition figurative, which is to “transfer figures.” For example, I see a bunch of flowers that my wife has bought in a market, and then colors come to my mind little by little, such as yellow or red, from which I draw inspiration.